"Before you just sat there and you didn't know what was going on and you were frightened to ask, but now you can ask your friends, or ask your team, you're not on your own, learning's great." Mills Hill School is a UK Primary school with 450 children aged 4 to 11 years old. The school serves a culturally diverse community and has a strong commitment to embracing community cohesion and preparing children as inclusively minded citizens. "Success in developing social skills is the basis for excellent learning that pupils experience when they learn together in small groups. The school adopts a consistent approach to learning cooperatively that not only benefits pupils academically but also socially." An earlier inspection report that identified areas for development related to learners' social and behavioural skills with a requirement to raise the levels of achievement across the school. A newly appointed headteacher also acted as a catalyst for change. 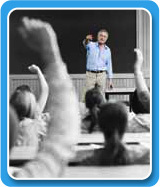 "Learning was chalk and talk, hand out worksheets, put your hand up to be selected. Staff were like post people delivering a package of work. Learning was not our agenda—school was a dull place." Self-evaluation sessions with learners and staff highlighted over a quarter of learners who were not actively engaging in their learning with significant behaviour issues across school and low levels of aspiration and achievement. As a result the Leadership Team established a school focus around the development of an agenda for "learning." During this development stage, members of the Leadership Team attended a range of conferences with various initiatives tried within the school. Impact was often time limited with a lack of consistency. During a day visit to a secondary school and primary school within the UK, the headteacher experienced cooperative learning in action. 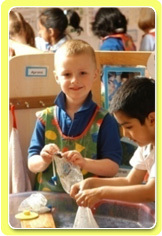 Structures were used to engage learners from 4 year olds to 16 year olds. The headteacher described as "a light bulb moment." This experience was the launch pad for the schools future success and implementation of Kagan Cooperative Learning. Two members of the school staff were sent to the Kagan Summer Academy to train and explore the benefits of cooperative learning. "I've never been so eager to get back to school as I wanted to try things out and develop cooperative learning in my class." —J. Garratt-Simpson, Deputy Headteacher Mills Hill School, reflecting on the experience of attending the Kagan Summer Academy.